Kids can be irritating. Especially at the movie theater. They talk loud, throw things, and worst of all, some just won't stop kicking your seat. But that's no excuse for the actions taken by one man in Paducah, Kentucky this weekend. He allegedly got in a fight with one child's dad before pulling a gun on the surprised tyke and his father. As you can imagine, in today's social climate, this did not go over well with, or for, anyone involved. 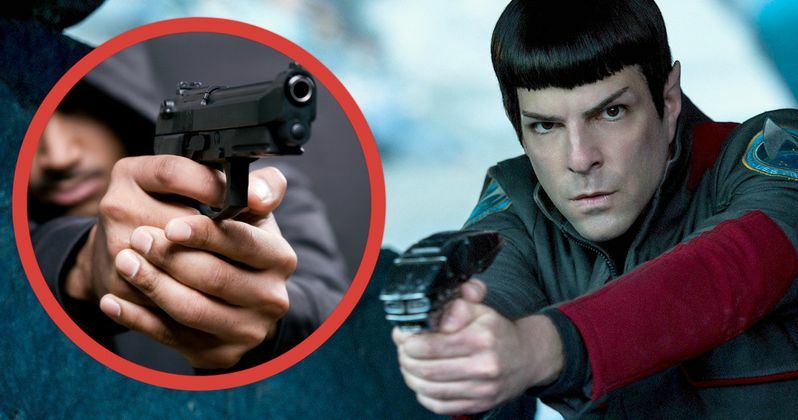 Witnesses who were seated inside the theater, which was showing Star Trek Beyond at the time, claimed the man pulled the gun on the boy and his father after the kid refused to stop kicking the back of the suspect's seat. Police in Paducah are now seeking charges against the Illinois man, who unwisely unleashed his firearm inside one of Cinemark's movie palaces. This is the same chain that lays claims to the infamous Dark Knight movie theater shooting incident from 2012. Police officers were called to the movie theater at 11:50 am on Saturday morning just shortly after the fight broke out in the theater. The Paducah Police Department has a pretty detailed account of what went down on Facebok. Here's their report in full. "Paducah police will seek charges against an Illinois man who pulled a gun this morning inside a movie theater at Cinemark Theater. Officer Dana Davie said officers were called about 11:50 a.m. today after a fight broke out inside the theater. A man told Davie that he and his son were sitting behind another man, and the son was kicking the back of the man's seat. Witnesses said the man got up and cursed the youth, asking if he was going to continue kicking his seat. The boy's father interceded and a fight broke out between the two men. As the father got the upper hand in the fight, witnesses said, the other man pulled a gun and said, "What the (expletive) are you going to do now." Others in the theater saw the gun, and began running for the exit. Three men - theater employees and patrons - escorted the man from the theater and were outside with him with officers arrived, Davie said. The movie-goers who fled the theater in which the fight occurred were allowed to return. This was the only theater in the building affected by the incident, Davie said. The man was barred from Cinemark property, and police will present their investigation on Monday to the McCracken County Attorney's office for charges." Police are planning to present their investigation into this case to the McCracken County Attorney's office today. It isn't known when we can expect to hear a follow up to the case. And it isn't known how serious the man's intentions were. Having to sit while some kid kicks your chair is a theater going staple since probably the invention of the projector. In this day and age, it's much easier and wiser to simply get up and move without disrupting an entire theater. Pulling a gun on a kid just isn't the way to go.